How much longer will this population of Treron calva calva survive? 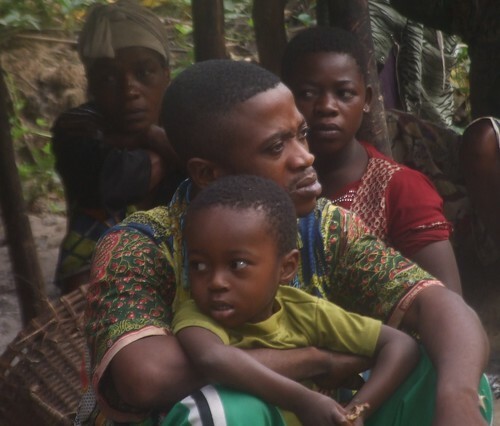 The Bangengele say that the salt opening in the forest is theirs; the Balanga say that it belongs to them. It is the Balanga who have turned it into a pigeon killing field. The pigeon hunters pay tribute to the family of the Balanga chief, Chef Butumbe. And the merchants who come with soap, medicine or food pay a portion of all revenue to the same family. The head of camp or PDG, Nyembo Butumbe, is the chief’s eldest son and operates the salt opening like an artisanal gold camp. The pigeons, like gold, will be mined until they are no more. Perhaps it is the ambiguity of ownership that makes the management of this resource so shoddy. Perhaps the Bangengele will eventually be organized enough to kick the Balanga out, so why shouldn’t the Balanga exploit this opening to its limits now? How else explain the irrational slaughter of the pigeons? Already there are many fewer than a decade ago (down by 3/4 ) when the Balanga started killing them. Where the salt water bubbles up. 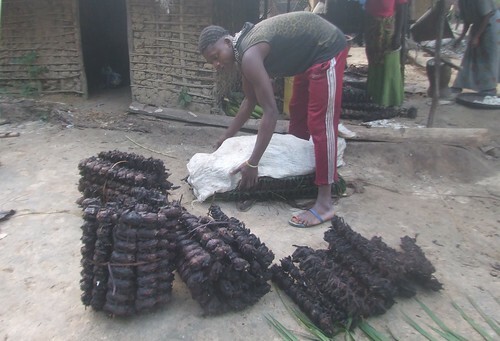 The first I heard of pigeon fast food was from Crispin last year when he told us about how they are killed, skewered ,smoked and packed out, first by foot and then by bicycle to the markets of Kindu. Crispin has led TL2 efforts to halt the slaughter. First results seemed positive. The governor, Didier Manara, declared a closed hunting season and then he asked for a special investigation of the pigeon slaughter. All pigeon hunting stopped. The hunting season reopened but pigeon hunters stayed away from the salt openings. Through December the pigeons flocked in peace, but in January as the Governor lost control of the province, the capture nets returned. And the culture of killing resumed. Caught in nets strung over the salt mud. 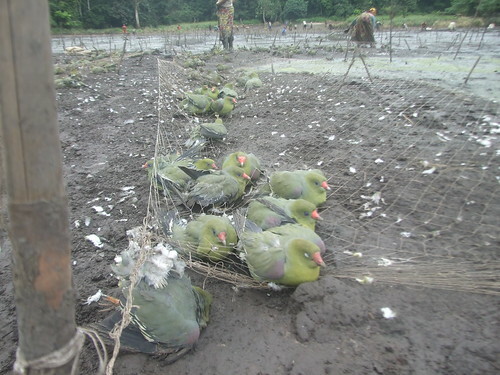 The nets are emptied twice daily. The birds are plucked alive, then skewered and the neck broken just before set over the fire. This keeps the meat at its best quality in the hot climate. The pigeons are dried by the hundreds over low fires. Packed into home-made liana backpacks, the pigeons are carried two long days to the road. Pigeon porters negotiate many small bridges. Once on the road, it is another two days by bicycle to reach the Kindu market. Certainly there must be a better way to make a living. These birds come from what distance? How much forest is losing its pigeons? 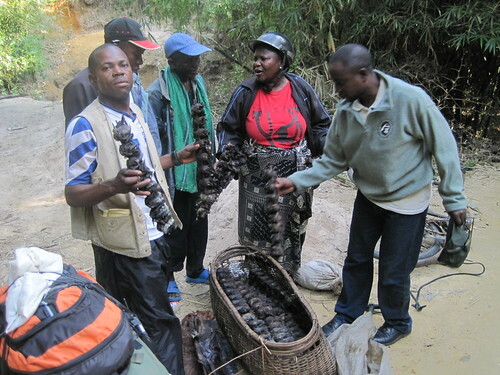 The Chefitaine Jeanne Machozi of the Bangengele confiscated dried pigeons being transported by bicycle over her chefferie. Crispin is on the left; the ICCN regional bureau chief on the right. With the support of the Administrator of Kailo Territory and the Provincial Minister of the Environment, Crispin led a group of military in to clear out the salt opening during the second half of March. 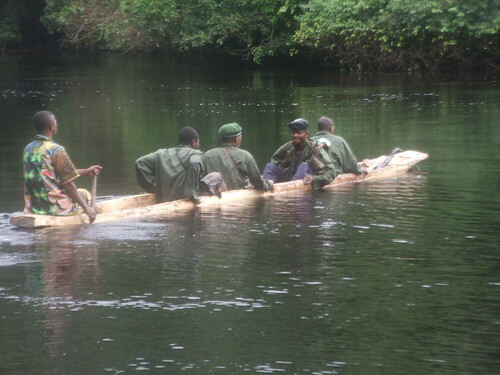 Miltary crossing the Kasuku River on the way to the pigeon camp. It is quiet again, but this is a temporary reprieve. The pigeons will only be safe once the salt opening is included in a national park. 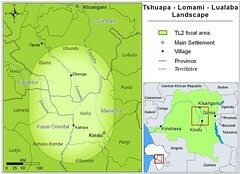 A national park is our (TL2 project) goal and the goal of Congo’s Conservation Agency (ICCN). 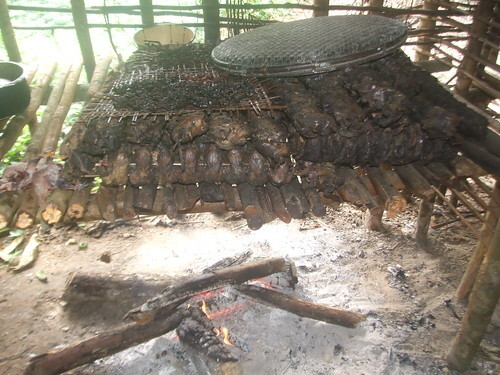 This entry was written by Terese Hart, posted on 2010-05-09 at 11:42 am, filed under About the project, Bushmeat. Bookmark the permalink. Follow any comments here with the RSS feed for this post. Post a comment or leave a trackback: Trackback URL. Forest clearings where pigeons flock to the ground in the thousands are apparently not a common phenomenon in range of the green pigeon. Our colleagues who study the big elephant and gorilla clearings (bais) in Congo-Brazzaville and Gabon do not report this. 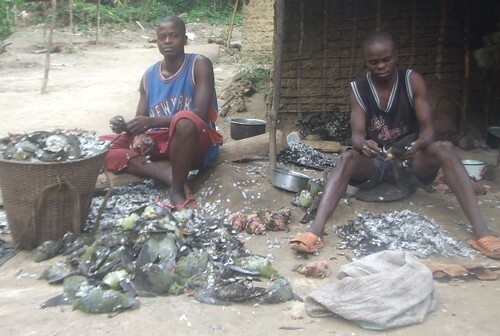 We know of two major “pigeon parks” in the Kindu region, one of which is in the TL2 landscape. Both are exploited by pigeon trappers. 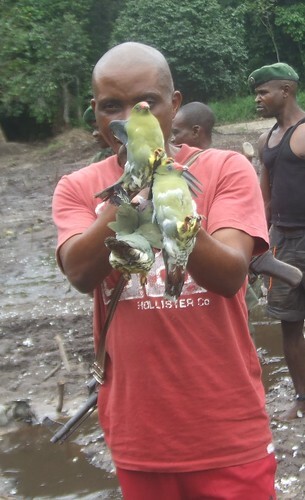 We know of a third clearing, Mehwa Edo in the Okapi Faunal Reserve in the Ituri Forest, that is frequented by pigeons, parrots, turacos as well as elephants and other mammals large and small (see link in the post). Geophagy is well known in animals and humans (http://en.wikipedia.org/wiki/Geophagy). In Peru and Bolivia spectacular concentrations of parrots come to specific clay banks to eat soil. 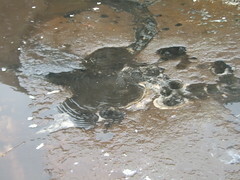 In this case, the ingested clay is thought to aid the birds in buffering the effects of natural defensive toxins in the seeds and unripe fruits they eat (http://cogweb.ucla.edu/Abstracts/Diamond_99.html). It is interesting that both the TL2 Parc de Pigeon and Mehwa have concentrated mineral seeps on sandy or rocky substrate with very little clay. In the Ituri Forest, clearings that develop around clay pits dug by elephants get plenty of visitation by various large mammals, but are not descending points for pigeons or parrots. And to add to the complexity, the TL2 salt seeps attract only green pigeons, and not other species of birds….Much is clearly to be learned here. But all will disappear without active protection. I am sending a small donation via Paypal. I was very distressed to read about what is happening to the pigeons. I hope the donation helps in some way. I wish you could blog on Wildlife Direct as well because a lot of people from around the world read the blogs on that site. Please let us know what we can do to help more! Money or write letters? Many thanks. 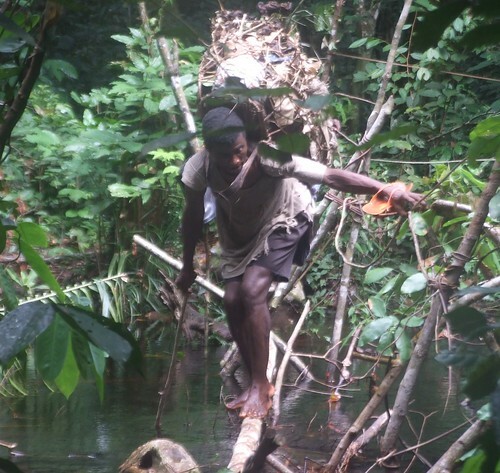 Your donation will be used to push the national park process ahead in Maniema. We are still having a series of traditional ceremonies (one of which chef Butumbe participated in), then there will be a participatory delimitation. We are optimistic. I think letters now would not be effective but once the park exists — letters of congratulations and expressing a desire to visit will be excellent and I will post how to send them. Excellent post mama, and excellent addition by the Baba. Colleen, The green pigeon is a beautiful bird. And it is a family group with a number of subspecies….I think that the one in TL2 is one of the most handsome. We have many more pictures and am excited that you are interested in drawing them. I am now in Kisangani though and am sure that I could not upload them…will upload a bunch to flickr when I am back in Kinshasa. I look forward to those pictures to come while enjoying those already posted… except when they are cooked of course. Seems like a problem the whole world is familiar with – the depletion part. In Egypt i recently noticed these beautiful little structures dotting an otherwise boring landscape – they were pigeon breeding homes… i am sure those birds are better off than american chickens…maybe there is a solution involving raising pigeons if possible in your area…? I enjoy your blog and find it very informative. About how big do you anticipate the national park in the TL2 to be? The area that we are recommending for complete protection (national park) is 7,750 km2. There still are some pretty significant stages of popular consultation and participative delimitation to go through before we reach that stage.